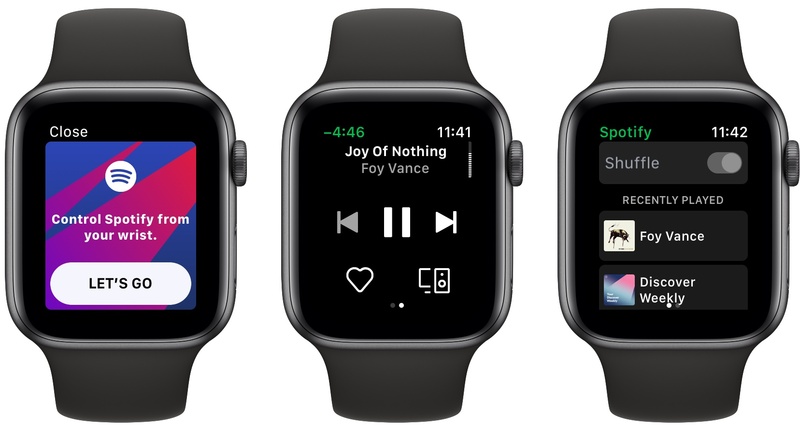 The latest version of Spotify for iOS has been released, and it includes the music player's first Apple Watch app. The App Store release notes stress this is merely a "first version" of the Watch app, which is reassuring considering how limited the app is now. Spotify's Watch app currently serves as a way to start playback of recently played music, and control that playback via play/pause, skip, and volume controls. You can also choose a connected device to send music to, and like a song to add it to your collection. And that's it. As a 1.0, Spotify's Watch app covers the basics well. I'm especially pleased that volume control via the Digital Crown is enabled here. Spotify has designed its own custom volume indicator, visualized as a vertical dotted line in the upper right corner of the screen, and it's especially satisfying to see each area of the line fill in sync with the haptic clicks of the Series 4 Watch's Digital Crown.